So on the flight to Atlanta, earlier this week, I did something I haven’t done in a very, very long time. Oh, I read on planes occasionally, but usually I do it on my phone because I read extremely fast so I’d need to bring 2 or 3 books per flight, and those start to get heavy really quickly, especially if one isn’t checking one’s luggage. Mostly on planes, I tend to knit, as at least that way I’m getting something productive done. But for the flight to Atlanta, I wasn’t able to get an aisle seat (preferable for knitting), and instead I had a window. And while I was packing, I noticed the stack of books-to-be-read on the shelf and decided that a flight to Atlanta was the perfect time for a crash course in neuroscience – the inner workings of the human brain. I am speaking, of course, of the absolutely delightful book by Timothy Verstynen and Bradley Voytek: Do Zombies Dream of Undead Sheep? : A Neuroscientific View of the Zombie Brain, which I received as a Christmas present a year or so back and for some bizarre reason, never got around to reading until now. I read the entire thing on the flight to Atlanta (and had time left over to take a nap) and thoroughly enjoyed the book. It made me giggle under my breath more than a few times, while at the same time providing a fairly comprehensive (for the non-neuroscientist, that is) overview of the inner workings of the brain, and all the myriad things that can go wrong with it (with the accompanying symptoms), all while laying out a hypothesis for the sorts of damage to the brain that could result in a zombie. If you like science, and anatomy, and also have a passing fancy for zombies, I highly recommend it. So I feel as if each snowflake I make, I get one teensy tiny baby step closer to knowing what the heck it is I am doing. 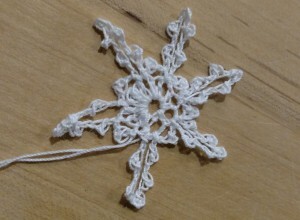 Here is today’s snowflake, which shall be used as a visual example of how I really need to figure out how to get a more consistent gauge when I am crocheting. But overall, it’s not that bad. The general shape is there, and I suspect that when I do the final starching & blocking of these things at the end of the month, I will able to smooth out most of the lopsidedness. Maybe. Making one snowflake a day for Thingadailies.